Draft: 1999, Oakland Athletics, 2nd rd. 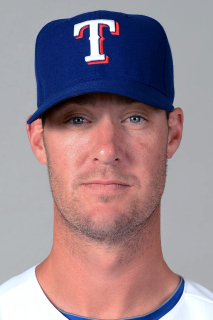 March 30, 2015 Texas Rangers released LF Ryan Ludwick. February 9, 2015 LF Ryan Ludwick assigned to Round Rock Express. February 4, 2015 Texas Rangers signed free agent LF Ryan Ludwick to a minor league contract and invited him to spring training. October 30, 2014 LF Ryan Ludwick elected free agency. August 12, 2013 Cincinnati Reds activated LF Ryan Ludwick from the 60-day disabled list. July 28, 2013 Cincinnati Reds sent LF Ryan Ludwick on a rehab assignment to Louisville Bats. July 24, 2013 Cincinnati Reds sent LF Ryan Ludwick on a rehab assignment to Dayton Dragons. April 15, 2013 Cincinnati Reds transferred LF Ryan Ludwick from the 15-day disabled list to the 60-day disabled list. Torn cartilage in his right shoulder. April 2, 2013 Cincinnati Reds placed LF Ryan Ludwick on the 15-day disabled list. Torn cartilage in his right shoulder. December 10, 2012 Cincinnati Reds signed free agent LF Ryan Ludwick. November 3, 2012 LF Ryan Ludwick elected free agency. February 8, 2012 Cincinnati Reds signed free agent LF Ryan Ludwick. October 30, 2011 LF Ryan Ludwick elected free agency. September 7, 2011 Pittsburgh Pirates activated LF Ryan Ludwick from the 15-day disabled list. September 2, 2011 sent LF Ryan Ludwick on a rehab assignment to Indianapolis Indians. August 24, 2011 Pittsburgh Pirates placed LF Ryan Ludwick on the 15-day disabled list retroactive to August 23, 2011. Mid-back muscle spasms. August 1, 2011 Pittsburgh Pirates activated LF Ryan Ludwick. July 31, 2011 San Diego Padres traded LF Ryan Ludwick to Pittsburgh Pirates. July 31, 2010 San Diego Padres Traded Corey Kluber to Cleveland Indians; Cleveland Indians Traded cash and Jake Westbrook to St. Louis Cardinals; San Diego Padres Traded Nick Greenwood to St. Louis Cardinals and St. Louis Cardinals Traded Ryan Ludwick to San Diego Padres. July 24, 2010 Ryan Ludwick roster status changed by St. Louis Cardinals. July 20, 2010 sent OF Ryan Ludwick on a rehab assignment to Memphis Redbirds. July 3, 2010 Ryan Ludwick roster status changed by St. Louis Cardinals. June 26, 2010 St. Louis Cardinals placed RF Ryan Ludwick on the 15-day disabled list. May 29, 2009 St. Louis Cardinals activated RF Ryan Ludwick from the 15-day disabled list. May 13, 2009 St. Louis Cardinals placed RF Ryan Ludwick on the 15-day disabled list. Strained right hamstring.